Stool with Adjustable Footrest. Self Skinned Urethane Seat. One Touch Pneumatic Seat Height Adjustment. Adjustable Footrest. 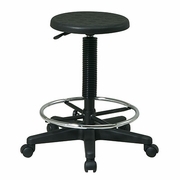 Heavy Duty Nylon Base with Dual Wheel Carpet Casters.